Learn how to promote and build an effective marketing strategy for your mobile application. After releasing an app, you hope for an increasing number of downloads. This won’t happen, however, if you don’t promote the app. After trying plenty of promotional methods, we at UPTech figured out the seven most effective ways to attract app users. But first, let’s find out how users learn about new apps. In October 2016, Google asked 999 American smartphone users how they discover, use, and stay engaged with apps. Most users find out about new apps from friends or family (51%), by browsing app stores (48%), looking at recommended apps in the app store (34%), and seeing in-app ads (33%). So, to increase app downloads, make your app easily discoverable in the app store and also promote and advertise it. The goal of app store optimization is to let the user find, click, and download your app through the app store. It focuses on keyword and conversion rate optimization. The key factors that influence app position in the search results are the number of downloads, the app’s rating or user reviews, and number of comments. You want users to remember your app’s name, and at the same time, you want them to quickly figure out what your app is about. This can be done with your app’s title. 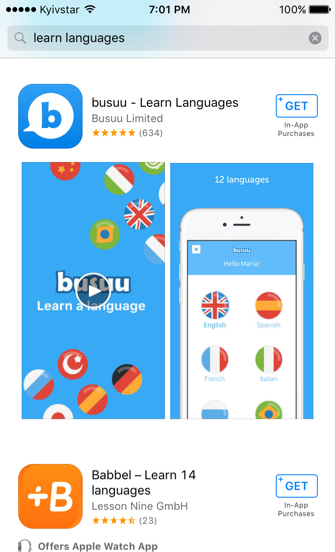 For example, if you have an obscure name for your app, like “busuu,” you can add a brief app description, like “Learn Languages,” to the title. If you had just “busuu” in the title, it would be too general, and users would not know what the app is about. 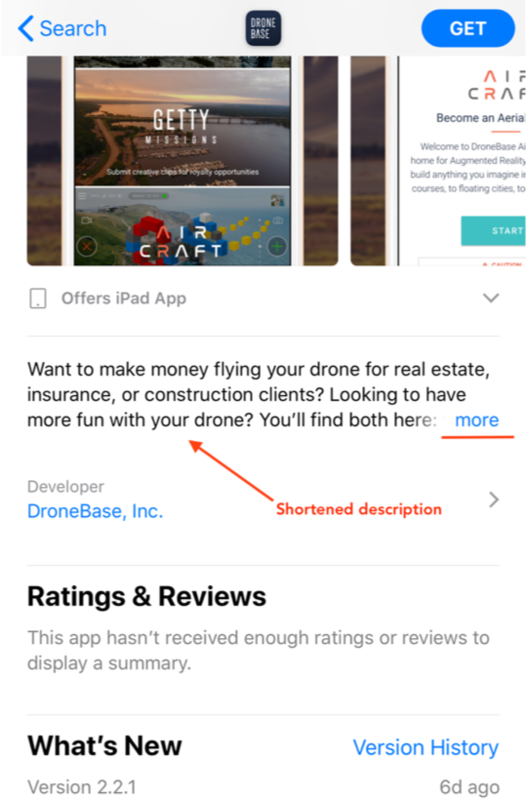 Put the most important app features in the beginning of the description to drive users to click the “read more” button. 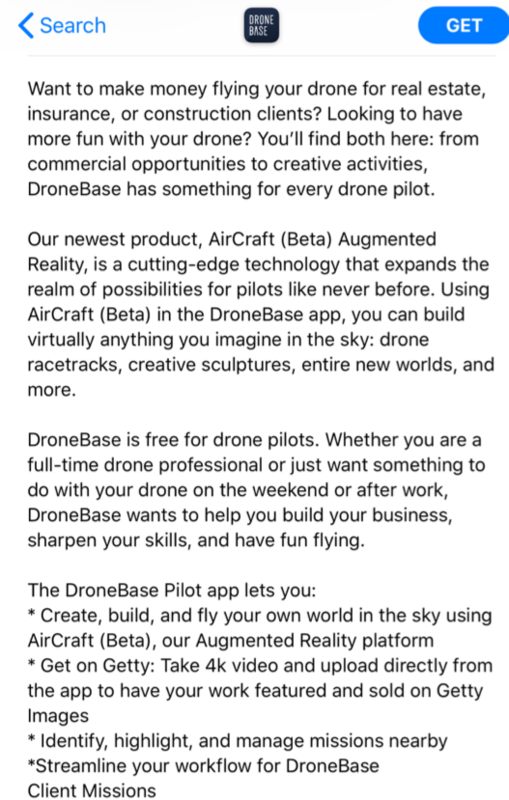 For instance, take a look at the description of the Drone Base app in Apple App Store. The first screen shows the shortened text, and the second one shows the full text after clicking the “more” button. The optimal number of keywords to mention in the description is five. There are also special keyword sections you should fill out in the app store. Think what words customers will type in the search tab to find your app. It’s essential to check the specific rules and guidelines for your app store. For example, Apple’s recommendations on what to do when selecting keywords mentions avoiding special characters — such as # or @ — unless they are part of your brand identity. The number and value of your reviews influence the app’s position in search results. The app store shows the user the apps he will most likely download. As reviews significantly influence buyer decision, the more good ones you have, the better. Check out a few tips on how to improve app ratings. For instance, you may run a contest, create a review plugin, or leverage Helpshift to provide direct and immediate support. An app icon is a small image that visualizes the app. A good-looking, interesting icon can help influence the number of user clicks on the app. Quite often, an icon is the only visualized element users see when browsing an app store. After installing the app, the icon appears on your phone menu and reminds users to open the app. Your icon should reveal the purpose of the app and, at the same time, intrigue users. Pay attention to the app store’s requirements when designing the icon. Apple's recommendations for creating an appealing icon include embracing simplicity, providing a single focal point, and keeping icon corners square. Like with an icon, including interesting screenshots and videos of your app will help influence its number of downloads. They help the user feel what his experience will be like on the app. For example, Grammarly created an appealing app video that showed potential customers the look and feel of its app. In 9 seconds, the video shows the app’s functions and its value for users. If users are browsing categories to find an app, one mistake could decrease the number of downloads. In the iOS App Store, you can add the primary and secondary categories (choose from “Books,” “Entertainment,” “Business,” “Education,” “Photo & Video,” “Productivity,” “Lifestyle,” and more). In Play Store, you can choose a category and subcategory (for “Games” and “Family” categories). If you’re hesitating between two categories, it’s better to choose the one with fewer competitors. This also depends on the app, but don’t ignore common languages beyond just English, as there are millions of potential customers who may not download your app for one reason: They don’t speak English. The amount of text to translate is usually small, but don’t forget to change all texts in images and videos. Your goal is to make users interested enough in your app to download it. This can be done on your website. If you have a corporate website, make a separate page for your app and an unobtrusive banner that leads to the page in the footer or side areas. For example, our client Aspiration created a page for its mobile app on its main website. The landing page shows the advantages of the app and briefly explains how to use it. 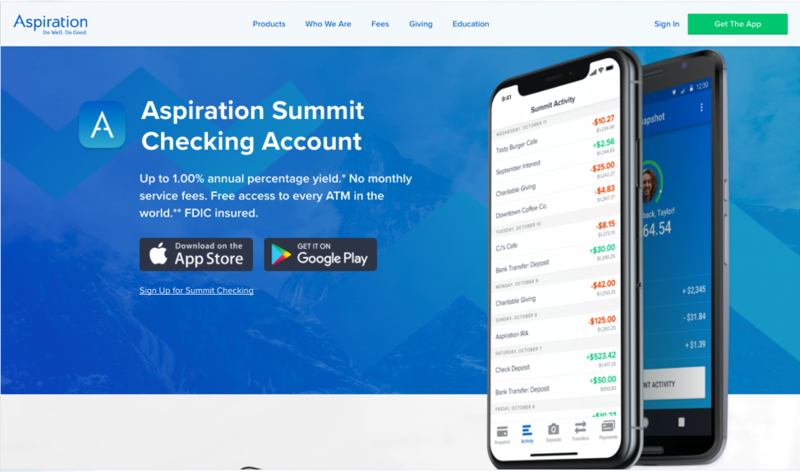 Aspiration’s app page is easy to read and includes clear call-to-action buttons that lead the customer to the app stores. It’s important to avoid making the site or page too long or complicated; your goal is to lead the user to the app store. Don’t forget to add a download link on your mobile website, as its visitors are the target audience for your app. 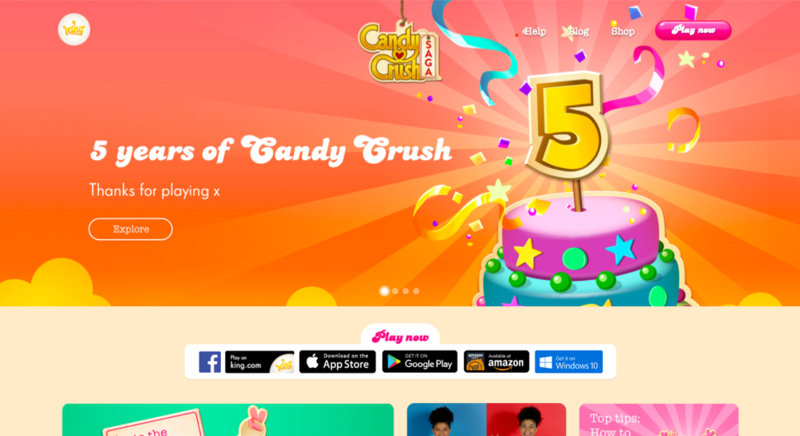 A good example of a website solely devoted to an app is the Candy Crush Saga app website. The company built an entire website for the app with a clear call to action to download the app. The Candy Crush website also includes a blog, a page with website terms, a Q&A section, and a shop. 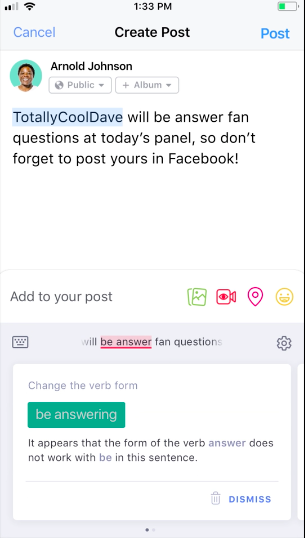 These extra features allow users to learn more about the app and answers questions they may have. If you already have a base of subscribers who know and trust your company, email marketing could help influence existing subscribers to download your app. 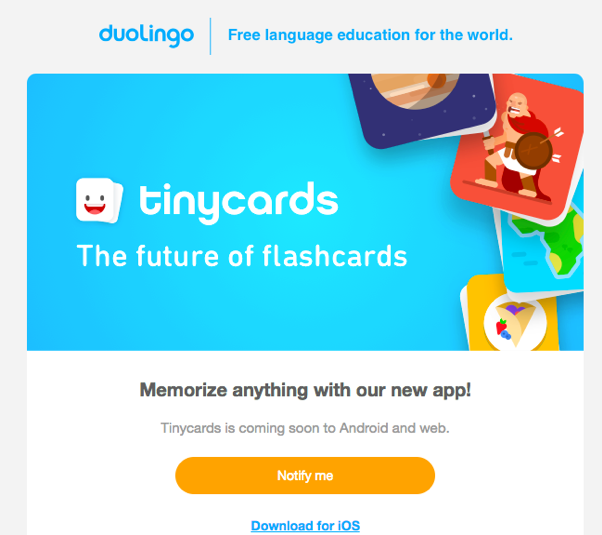 For example, Duolingo, a language-learning app, created an email campaign to attract users to its new app — Tinycards. By promoting a new product to existing users, Duolingo appeals to those who are already interested enough to subscribe to the company’s emails. If the app is your start-up and you don’t have a subscriber base, it’s better to first create a buzz about your app on social networks or offline. Once you do, you can collect emails and then continue engaging users with email campaigns. Internet users spend 30% of their time online on social media. Most of them access social media using a mobile device, which means it will be easier for them to download an app that catches their attention in their newsfeed. The social media platforms you choose should depend on your target audience. The most popular platforms are Facebook, Snapchat, Instagram, Twitter, LinkedIn, Pinterest, and Tumblr, all with different types of users; for example, if your app targets millennials, consider using Instagram and Snapchat, platforms millennials use most; if you have a B2B app, promote your app on LinkedIn and Twitter, where other businesses can be found. The main concept for app promotion, however, is the same for all platforms: Create viral content, increase likes and subscribers, and spread the word about your app. When talking about social media, consider both free and paid methods. It's free to post on your own social media accounts. Post engaging content, create publications in relevant groups, and invite friends to like and share your content. Most content should be visual — videos and images – because that is what appeals to consumers the most. 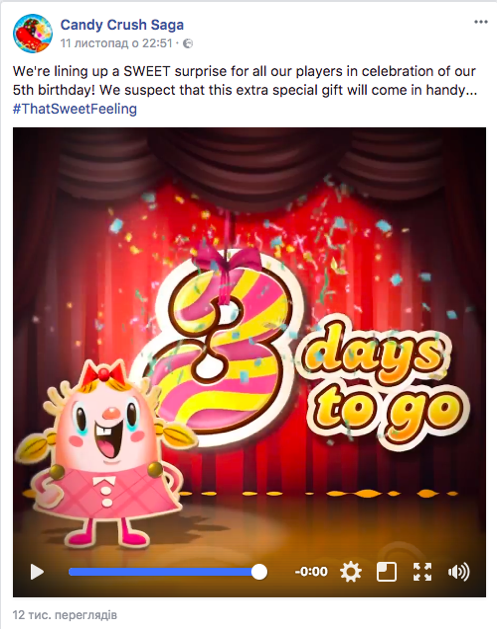 Candy Crush Saga’s Facebook page is a good example. Promoting its app with very visual content, such as videos, appeals to Candy Crush followers. 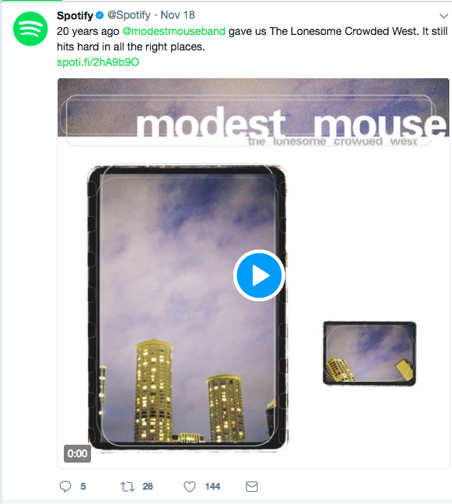 Another good example is Spotify's Twitter page. The company creates short videos and regular updates of the music world. Almost every tweet encourages users to open the Spotify app and use it more often. You can also increase your app downloads by advertising on social media. Targeted ads on Instagram, Twitter, and Facebook work well, as they let you precisely define your audience. For example, women’s online clothing store Zaful likely targets women of a certain age in its Facebook advertisements. 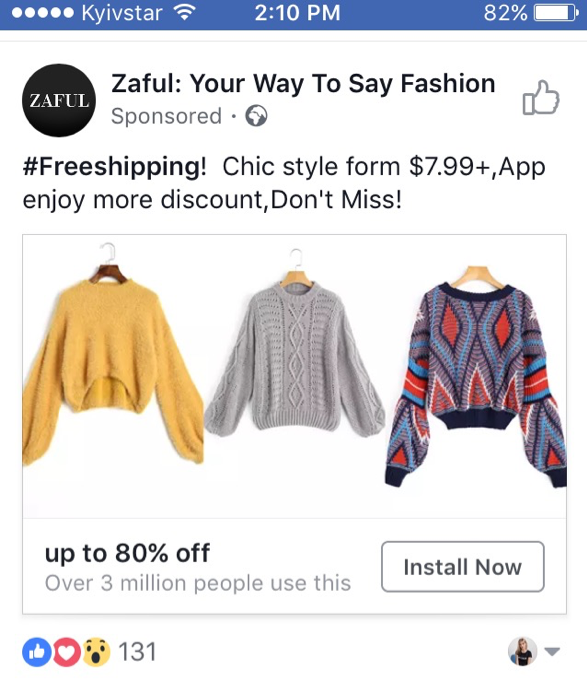 Zaful’s advertisement appears in the newsfeed and looks almost like a regular post. There’s an “Install now” button, too, which lets the user instantly download the app. To reach users who don’t actively use social media, consider launching online and in-app ads. About one-third of users (33%) discover apps while using other applications. This means in-app advertising is even more effective than search engine ads (31%). To save money, you can negotiate with other app owners and conduct cross-advertising to promote each other’s apps for free. 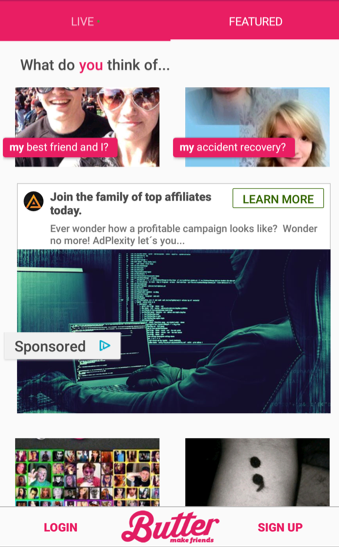 For instance, chat app Butter, an app we at UPTech developed, advertises other apps, such as AdPlexity, an advertising-monitoring app. This reciprocity of advertisements can help you advertise for free. If you want to create search engine advertisements, you can launch them using Google AdWords. The main point is to select keywords well. Select the appropriate keywords to pop up in the appropriate target audience’s search, and use filters to select visitors who use mobile devices. You can also create contextual ads using Google AdWords. Design banners with short text, and AdWords shows them to users who enter certain websites. These sites depend on the type of an app you have. For instance, if you have a traveling app, you might want to show ads on various travel blogs. Media coverage is another effective channel to attract app users. Reach out to people or companies and ask them to place information about your app. The most common way to do this is to write an email to the editor, mentioning why this information will be valuable to readers. For example, Product Hunt helps people learn about new apps on the market. 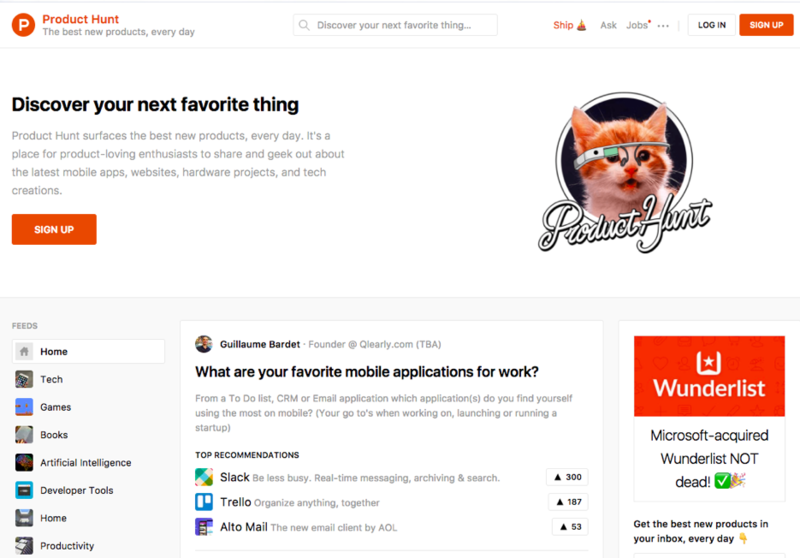 Product Hunt is the perfect platform for placing information about your new app release because people go on the site with the purpose of finding apps. Thanks to QR codes, it’s easy to redirect a user from printed material to a website or directly to the app store. Before printing these materials, consider where you are planning to place them and how to spread them among your target audience. For example, if your product is a fitness app, you could become a sponsor of marathons and put banners up at the venue, publish an overview in Shape magazine, and spread leaflets in fitness clubs. To attract mobile app users, you should analyze your audience, plan a promotional campaign, and stick to it. No matter what methods you choose, test content on small target audience groups, calculate your budget, and measure the success of your campaign. No marketing campaign can save a bad app, so, of course, focus on creating a good product in the first place. 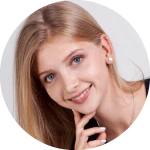 Anastasia Shpiliak is a marketer at UPTech, an outsourcing mobile & web development company in Kyiv, Ukraine, a specialist in mobile app promotion, developing marketing strategies and user acquisition.